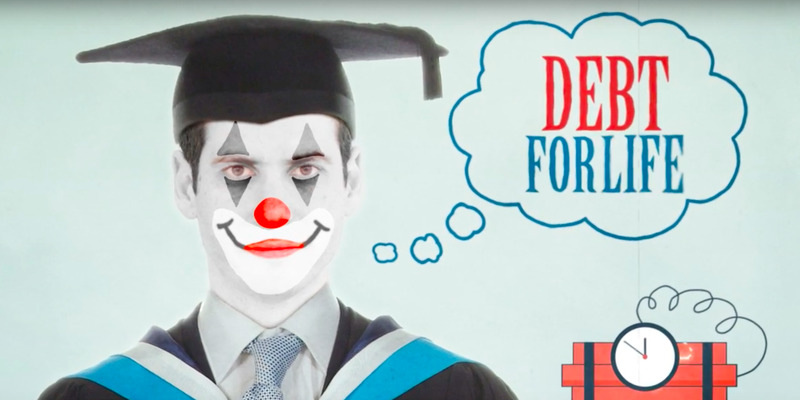 Creepy clowns have dominated headlines of late, and the student loan crisis has earned its fair share of alarming coverage as well. But these two horrifying storylines haven’t converged — until now. The music is pretty catchy, in a distinctly classic rock kind of way. I found the lyrics less compelling, but I am not a song writer, nor have I attempted to write verse about student loans (a hard task, I would imagine). So I’m loath to judge. Also, I’ve watched it at least a dozen times by now, so let him who is without sin cast the first stone. I followed up with band member Lazar Wall, who sent us the video, and he acknowledged that he had no personal school debt horror story that inspired him, but rather he is alarmed by the student loan bubble in general. Americans now owe $1.3 trillion in student debt. Wall cited his musical influences as Rush and Guns N’ Roses. If you’re not averse to clowns, check out the video below. *Note: The US 1-month treasury rate is currently 0.26%; student loans are in the 4% ballpark depending on the type of loan and when it was taken out, but they’re benchmarked against the 10-year Treasury note, which is currently at 1.75%.